Eighteenth-century antiquarian Pierre Eugène Du Simitière (ca. 1736-1784) collected all manner of material, including sketches, pamphlets, broadsides, political cartoons, and other “combustibles,” such as embossed tax stamp paper, with an eye to the future. 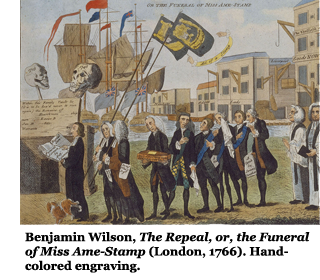 The aspiring historian foresaw the importance in saving the much-derided piece of ephemera from the Stamp Act crisis of 1765 as a tangible artifact of the rising tensions between the colonies and Great Britain. 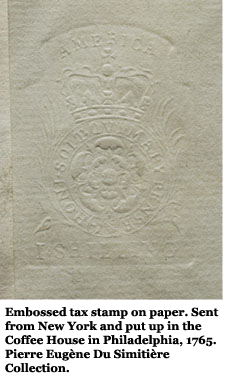 Imposed by Parliament on November 1, 1765, to help offset the cost of protecting and sustaining its empire in America, the Stamp Act required that virtually any form of legal or commercial paper employed in the colonies include the embossed revenue stamp. 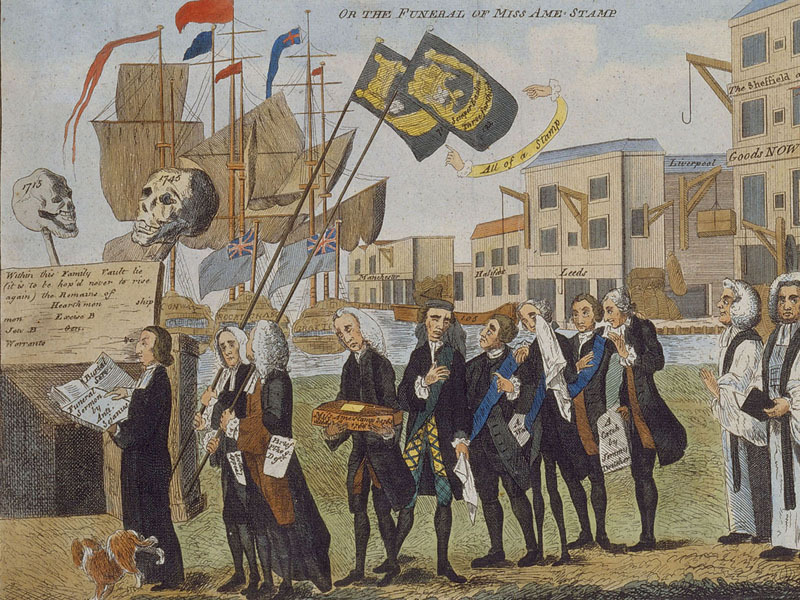 A firestorm of opposition erupted with colonists protesting the Act in the form of cartoons, pamphlets, embargoes, threats to tax collectors, and the burning of stamped paper. Protest continued unremittingly until the repeal of the Act on March 18, 1766. 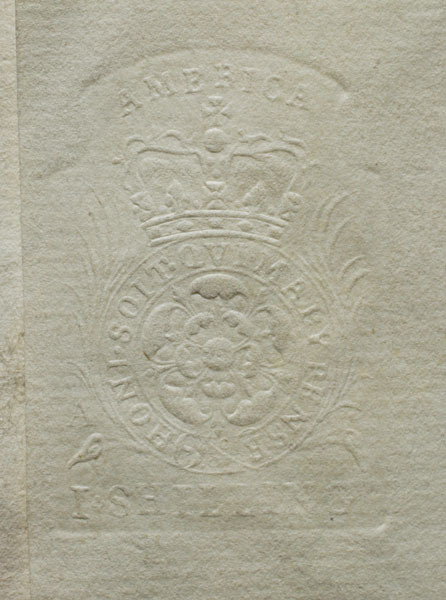 The tax stamp pictured here, saved from several boxes burned in protest in New York, forms part of a large collection of material assembled by Du Simitière and purchased by the Library Company at the auction of his estate in 1785. 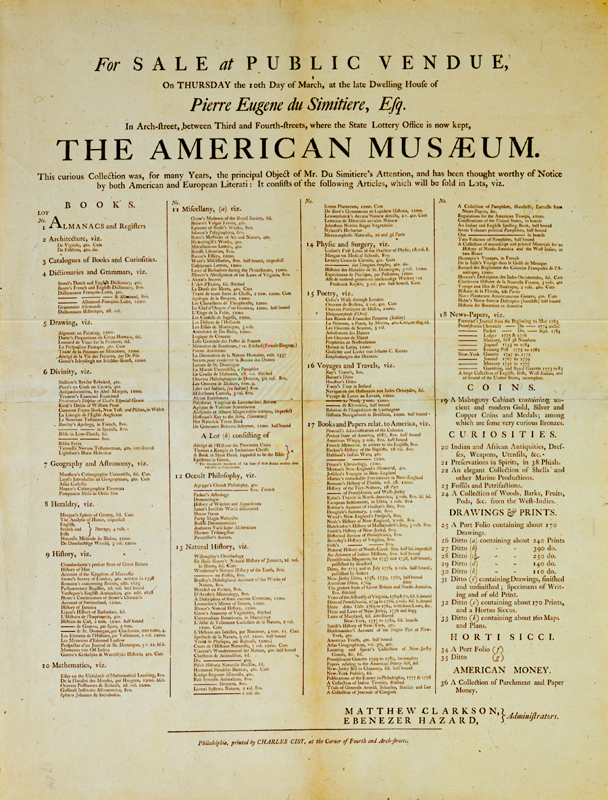 Once a part of his short-lived American Museum, the collection contains numerous pieces of ephemera documenting the American Revolution, including a 1776 broadside of the Declaration of Independence, a 1777 Pennsylvania militia draft notice, and proclamations issued during the British occupation of Philadelphia in 1777-1778. In addition to the Du Simitière materials, the Library Company holds a number of other notable collections of ephemera gathered by antiquarians. 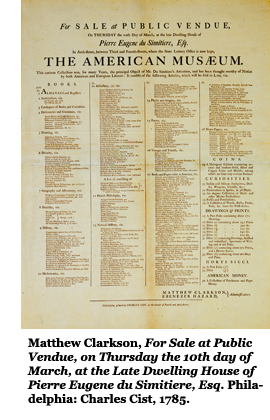 Charles A. Poulson gathered newspaper clippings, cartoons, and advertisements representing the daily political, business, and social life of antebellum Philadelphians in a series of scrapbooks that inform the casual reader as well as the professional scholar. John A. McAllister, from a family of Philadelphia opticians, voraciously collected anything and everything printed during the Civil War, including illustrated envelopes, song sheets, and paper soldiers. Emily Phillips, a Philadelphia socialite from a prominent late-19th-century Jewish family of philanthropists, gave the Library Company thousands of Victorian-era trade cards that provide a window not only on commercialism in the city, but the visual culture of the times. The Du Simitière collection was only the first of the Library Company’s extraordinary acquisitions of ephemera, which shed so much light on the everyday life of our 18th- and 19th-century forebears. To learn more about our collection, please view our online exhibitions and our digital collections.